The eighth release in our multi-award-winning and always intriguing Private Edition, Glenmorangie Bacalta brings new heights of complexity to a rare wood finish. 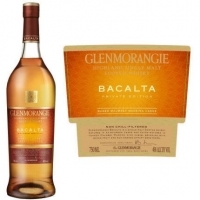 Inspired by the long, balmy days on the island of Madeira, Glenmorangie Bacalta (Scots Gaelic for "baked") is a sun-soaked single malt which delivers wonderfully warm layers of sweetness, brimming with baked fruits and honeyed tones. It has been created from Glenmorangie first matured in former bourbon casks, then extra-matured in bespoke casks baked under the sun which once contained Malmsey Madeira - the sweetest and most prized of the Madeira wines. Aroma: Fragrant, honeyed and sweet. Some ripe apricots, mead-like, and a curious flinty note, followed by sweet white chocolate. Taste: An initial burst of mint toffee, with baked fruits such as caramelised oranges, honeycomb, almonds and dates. Finish: A rich, syrupy aftertaste, with more caramelised citrus and pears, creamy fudge, and an intriguing mentholic sensation in the background.